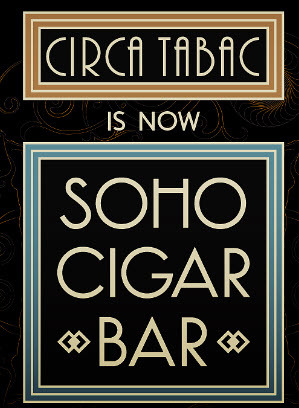 Much to our surprise, we learned at our November 2014 Monthly Meeting that Circa Tabac is now...SoHo Cigar Bar! After a long successful run being known as, Circa Tabac, one of the oldest cigar bar's in New York City, the brand name has been changed and the lounge has been revamped! There is everything and all of what we have come to love and enjoy about the place and now after the renovations, there's even more to love about our meeting place including the announcement of their own brand of cigars, Soho Cigars; can a line of pipe tobacco be next??? The Soho Cigar Bar will also now have extended hours on Saturday's and Sunday's, opening at noon. The new menu also includes an expanded rye and whiskey selection. Space is also available for both semi-private and private parties. Our great times at SoHo Cigar Bar continue... The club has been made to feel extremely welcome by our friends at SoHo Cigar Bar and I cannot express enough how much we appreciate that. So, let's be sure to extend our thanks to the management, our new friend Lee, as you enter and especially make sure that we take care of our servers when settling our tabs. It is a privilege for us to have the opportunity to experience this new and different venue in our fair City that is still smoke friendly, a rare commodity these days! 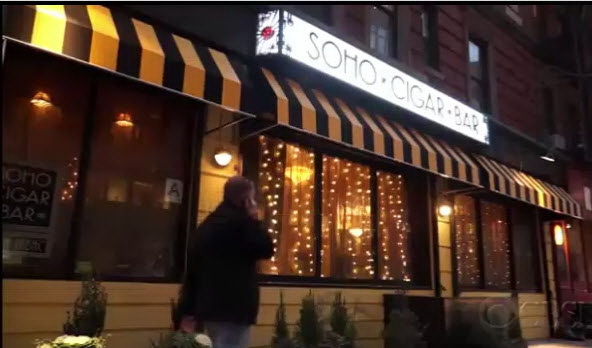 SoHo Cigar Bar is smoke friendly, offers light fare, fine drink and comfortable lounge seating.